Grand Cayman, Cayman Islands This port was cancelled due to a horrendous storm! The first half of the week, we were seasick. 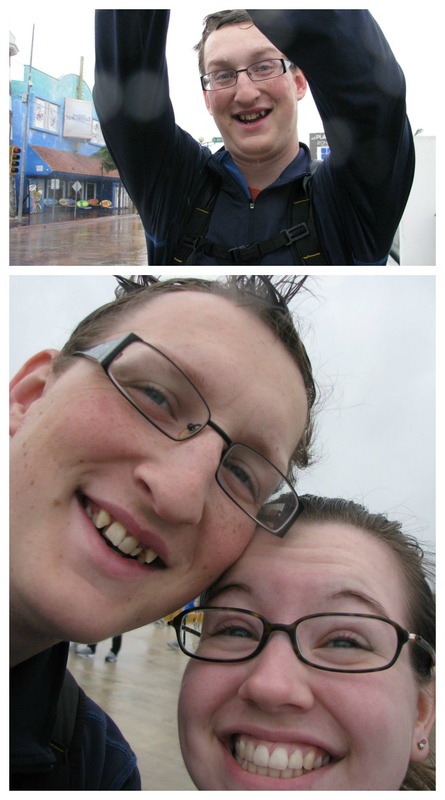 There was a huge storm, the waves were huge, and we were on the bottom deck. Needless to say, we were pretty miserable. In fact, I was contemplating whether we could fly home at the next port. Despite the seasickness and storming, we had a ton of fun. We went to clean comedy shows, ate too much, walked around the ship, ate too much, watched movies, ate too much, and attended the live entertainment…. but only after we ate too much. 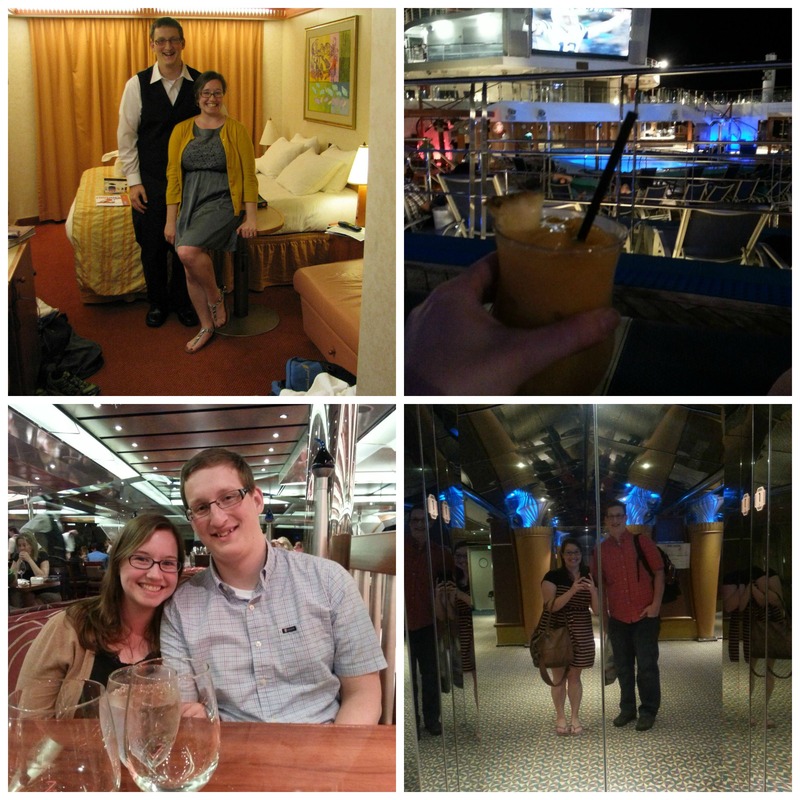 The first day of the cruise was beautiful and sunny, and we had so much fun exploring the ship. That night was formal night, and then things started getting rough. Honestly, though. We found it incredibly relaxing that the trip had been planned and paid for, and all we had to do was enjoy it. In Belize, we signed up for a bus tour and the Altun Ha Mayan Ruins tour. This was the perfect mix of relaxation, adventure, and education for us. We learned so much about the country of Belize, got to see the city, and explore the ruins. (And, if you sense a theme, got a bottle of Coke- which was amazing… it’s made with real sugar cane.) Belize was probably my favorite stop, because of the different components of the tour. I felt like we really got a taste of the culture through the tour, and we also felt so safe the whole time (well…. except for climbing up the ruins… I was shaking so bad! What you can’t see in the 3rd picture is my knees knocking and me grabbing Josh with all my might!!!). We had planned to do snorkeling in Grand Cayman or Cozumel, but it was cancelled due to the weather. So we decided to do snuba in Honduras (Mohogany Bay) instead. Snuba is like a combination of snorkeling and scuba. Hence, sn-uba. You have a mouthpiece connected to a hose that goes up to an oxygen tank, and you bite the mouthpiece to get air. I FREAKED OUT. Everytime I put my face into the water, it was like my brain could not comprehend that it was ok to breathe. So I did a lot of treading water, and it took almost the entire time out there to get myself to stop hyperventilating, get myself underwater, and have fun. I ended up having a ton of fun and enjoying it… so at least it ended on a good note! The sun was out, and we had some time before the bus came to take us back to the ship… so I chilled by the pool, which meant I got super burnt. Turns out, not having sunshine the whole week was good! Otherwise, I would have been super burnt and miserable. The cruise was such a wonderful escape for us. We made so many memories, and even found a way to laugh at our days of sea sickness. To this day, we make jokes that date back to that ship. For instance, see that fruity drink? That was from our last night. We went up to the main deck and Josh was watching a game. ALL I KNOW IS THAT THE PATRIOTS WERE PLAYING. And my drink was mango heaven. We also tried to get several people to take a picture of us dressed up, and all the pictures were grainy so we resorted to our own… which ended in hilarity. Before we knew it, it was time to go home. Our cruise marked the beginning of the greatest adventure of all; our marriage. We may not pop down to the Caribbean on the weekends, but you are bound to hear about our mini-adventures, whether that be trips to visit family, family vacations, anniversary trips, weekends away, or the things we do in-town to keep life fun.